This month's BIER Member Spotlights focuses on Kim Marotta, Global Senior Director of Corporate Responsibility at Molson Coors and participant in BIER's Water working group. 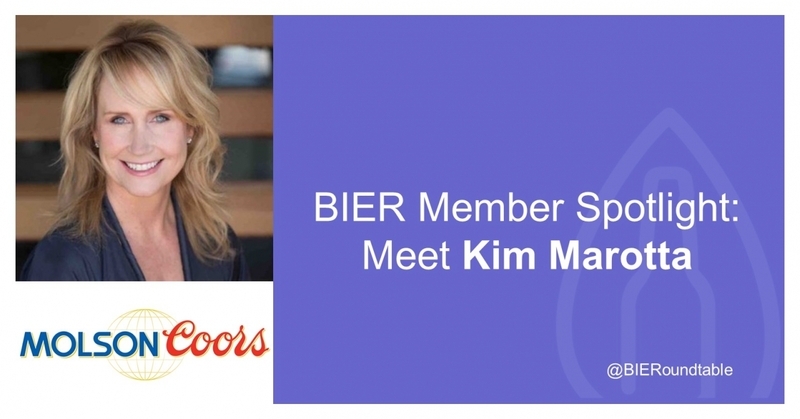 Learn more about Kim in this BIER Member Spotlight. The Beverage Industry Environmental Roundtable (BIER) is a technical coalition of leading global beverage companies working together to advance environmental sustainability within the beverage sector. BIER aims to affect sector change through work focused on water stewardship, energy efficiency and climate change, beverage container recycling, sustainable agriculture, and ecosystem services. BIER members include: American Beverage Association, Anheuser-Busch InBev, Bacardi, Beam Suntory, Brown-Forman, Carlsberg Group, The Coca-Cola Company, Constellation Brands, Diageo, Heineken, Jackson Family Wines, New Belgium Brewing, MillerCoors, Molson Coors, Pernod Ricard, Ocean Spray Cranberries, and PepsiCo. For more information, visit www.bieroundtable.com.